imaging system for the study of aura energy in relation to spell casting. how such a set up can help in the further understanding of energy manipulation. There is also some very good mundane opportunity to raise cash for further research in the time that is not being used for said research. So not only would this investment be an income for further studies, it would be a great asset to the study of energy, and how it affects the aura as a spell in being cast and as a spell is being received. I hope you can see how this would help us in research of magic and help us offset the cost with donations of any amount. 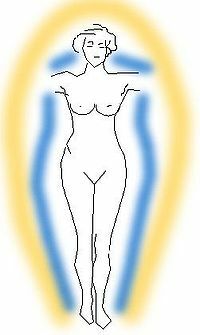 The Human Aura in a healthy woman after a diagram by Walter John Kilner (1847-1920). The picture depicts Kilner's "inner and outer auras." Colours have been added for illustrative purposes and have no other significance. Skeptics such as Robert Todd Carroll contend that people may perceive auras because of effects within the brain: synesthesia, epilepsy, migraines, or the influence of psychedelic drugs such as LSD. Other causes may include disorders within the visual system provoking optical effects. Eye fatigue can also produce an aura, sometimes referred to as eye burn. In Iran the aura is known as farr or "glory": it is depicted in association with Zoroastrian kings. Ideas of the aura are well represented in Indian religions. In tantric tradition of Hinduism, aura represents the subtle body of seven colours. In many Hindu paintings of gods and goddesses, aura is marked on their backhead. The Buddhist flag represents the colours seen around the enlightened Buddha. In Jainism the concept of Lesya relates colours to mental and emotional dispositions. To the Indian teacher Meher Baba the aura is of seven colours, associated with the subtle body and its store of mental and emotional impressions. Spiritual practice gradually transforms this aura into a spiritual halo. Hindu and Buddhist sources often link these colours to Kundalini energy and the chakras. Statue depicting Shiva as Nataraja with auras. In the classical western mysticism of neoplatonism and Kabbalah the aura is associated with the lustre of the astral body, a subtle body identified with the planetary heavens, which were in turn associated with various mental faculties in an elaborate system of correspondences with colours, shapes, sounds, perfumes etc. The symbolism of light found in the Bible is at times associated with the idea of the aura or "body of light": similar interpretations are found in Islamic traditions. According to the literature of Theosophy, Anthroposophy, and Archeosophy also, each colour of the aura has a meaning, indicating a precise emotional state. A complete description of the aura and its colours was provided by Charles Leadbeater, a theosophist of the 19th century. The works of Leadbeater were later developed by Palamidessi and others. Glenn Morris, grandmaster of the Hoshin Roshi Ryu lineage, included perception of the aura in his training of advanced martial artists. His experience was that it consisted of multiple layers. He described the most easily visible of these as being "light and denser than the air in which the body is immersed", typically half to quarter of an inch thick and correlating with the etheric body of an individual. Around this he described a yard thick egg-shaped layer reflecting hormonal state that he linked to the emotional body, and outside this, other barely perceptible layers corresponding to the mental body and beyond. Recalling the aura of another sōke, he wrote, "The first time I saw Hatsumi, he was running continuous bright, lime, neon green a foot wide and was so easy to see he would flash in bright sunlight". Tests of psychic abilities to observe alleged aura emanations have repeatedly met with failure. In another televised test another aura reader was placed before a partition where five people were standing. He claimed that he could see their auras from behind the partition. As each person moved out, the reader was asked to identify where that person was standing behind the slot. He identified only 2 out of 5 correctly. Another explanation for the belief in auras, given that there is no scientific evidence for their reality, could be cases of synesthesia. However, a 2012 study discovered no link concluding "the discrepancies found suggest that both phenomena are phenomenologically and behaviourally dissimilar." Clinical neurologist Steven Novella has written "Given the weight of the evidence it seems that the connection between auras and synaesthesia is speculative and based on superficial similarities that are likely coincidental."